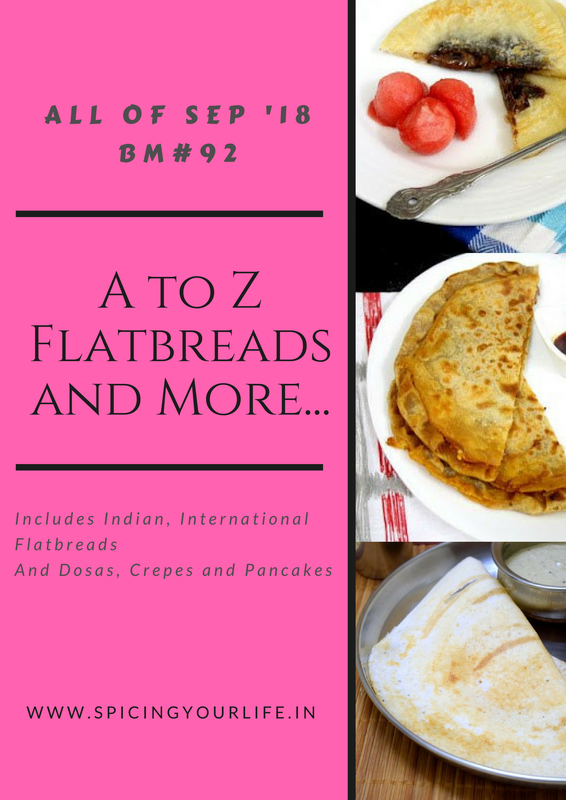 So, we are in alphabet Y in the A-Z Flatbread series and I was too tired to think of anything new / traditional with this alphabet and I easily settled for this easy Yellow Moong Stuffed Paratha Recipe. Moong dal is boiled al dente and some onions and spices are added to it to make the filling. It is a easy , filling and healthy flatbread that the kids loved to eat. Take wheat flour, salt in a bowl and mix well. Add water little by little and knead to a smooth and non sticky dough.Finally add a little oil and knead for a few more minutes.Keep aside. Take the cooked moong in a bowl. Add turmeric powder, chili powder, chaat masala, salt, onion,coriander leaves.Mix well. Take a ball of dough and flatten it.Place a tablespoon of filling in the center and bring the edges together. Roll it out into a circle and cook on a heated griddle till brown spots appear on both sides.Remove from griddle and repeat for the remaining dough. A healthy and filling breakfast dish. Take wheat flour, salt in a bowl and mix well.Add water little by little and knead to a smooth and non sticky dough.Finally add a little oil and knead for a few more minutes.Keep aside. Definitely a healthy recipe with the moong dal and spices. I wonder why they Y and Z recipes are are showing up as the next/previous posts on your space. Yellow moong daal parathas are a regular feature in our home . We add a little chopped onion and mint too and they taste super . Your parathas have come out very well and I feel like making these now . Incredible stuffing, i was looking for a mashed moongdal stuffing and here you are with a fabulous filling. I like these sort of easy and nutritious filling in my parathas.. Well done PJ. I add cooked moong dal in dough to make paratha.. love your version also as a stuffing. Nice and healthy parathas. That stuffing with moong dal and spices looks easy to make. These parathas are so healthy and nutritious, we don’t even need an elaborate side dish to enjoy. Yes I also remember making with the whole intact split moong dal as stuffing, makes it very nice when we bite into it..
Lovely recipe using moong dal for the stuffing. I something have some dry cooked moong dal left over. Now I know how to use it up. Wow moong dal stuffed in a partha makes it sort of a complete meal in itself. Ideal for kids lunchboxes. Innovative use of the letter Y.
moong dal stuffed paratha came out perfect. so filling and healthy. loved the stuffing with all spices, this makes all difference. That is a good change from the regular and the monng dal stuffing should give a little crunch to the paratha.